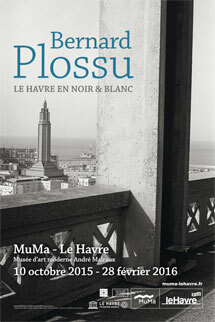 Bernard Plossu came to Le Havre in 2013 and 2014, leaving us with 104 photographs that draw a portrait of a city and a harbour… From the city rebuilt by Auguste Perret that he associates with the memory of Georges Braque's Cubism, to the dilated space of the port areas, by way of the 19th-century and waterfront districts and the long seaside promenade, Plossu takes us along on his journey. "Here we are back at the Le Havre station. I don't know why, but every time I come here, I'm struck by how much I like it! As a photographer who works with a 50 mm lens and silver emulsion, what I try to understand and share is a mix of it all—Perret's architecture, the giant container ships coming into port, the view from the vast windows of the Musée Malraux and, above all, the noise of the waves rolling over the pebbles: stop and listen to it, life is good here..."